The rechargeable flashlight series is the most affordable product line for all the electric torch of tank007. If you are under-budgeted , but you still need far range and more function, you can choose tc19 Q5. With a CREE XR-E Q5,and a 18650 battery, it can achieved 220 lumens brightness and the beam distance up to 280 meters. Also with a five modes for High-Med-Low-Strobe-SOS,it can meet your Multipurpose lighting needs. RC13 with three pieces of Cree xm-l U2, and 3*18650 Li battery. Its brightness is up to 2000 lumens,and beam distance up to 400 meters.with six modes for Super-High-Med-Low-Strobe-SOS.it is very suitable for police, outdoor search,adventure, hunting and emergency rescue.some disaster rescue and earthquake rescue need this big RC13. TC29B is an upgraded version of TC29A.with a CREE XR-E Q5 ,its beam distance up to 500 meters. Five modes for High-Med-Low-Strobe-SOS, and its brightness is 235 lumens. Its excellent performance can meet the lighting requirements of adventure, mountain climbing, hunting, law enforcement and so on. TC07 is my favorite torch, its appearance is unique in the world. The head of the stainless steel makes it look very high-end. with the CREE XM-L T6 LED, TC07 achieve 800 lumens, 300 meters of range. With a small size only 14.7CM , it is easy to carry. UC17 with a latest CREE XM-L2 T6, it emit a brightness for 800 lumens, and up to 300 meters. Personally speaking i think that its price is low for its performance. Because this product is a marketing strategy by TANK007 on the purpose to put pressure on its competitors. Tank007 need to expand its market share urgently in 2016. TC18 is a new arrival in MAY 2016. With 350 lumens, 40 meter’s range.it is so attractive and get great love from its customers. TC18 has a green fluorescence ring that you can find it at night easily.It also has zoom lens which can focus. With a diffuser diffuse and soften the light it can be used as a camping lamp.more important TC18 can charge for mobile phones. This is the launch of second innovative led flashlight by TANK007 after TR01 R5. TR01 R5 with 420 lumens, 200 meters for beam distance.it is the world's first exposed interface waterproof flashlight with a metal magnetic dimming switch in the head! It's a little expensive for its unique patent design but it's worth it. It is the only choice for professional flashlight lover who has perfect pursuit in quality and classical design.TR01 R5 is also a good military flashlight. TC60 with a Cree XM-L2 U2 LED, max brightness up to 1000 lumens. With a high capacity battery pack, and 2*18650 lithium battery. under40 lumens for 75 hours. TC60 can be use in law enforcement by police. TC128 R5 up to 420 lumens and beam distance for 200 meters, compatible with 2 CR123 or two 16340 or one 18650.With diffusers specially designed, it can work as a camping lamp or signal light, or EDC light. Specially designed magnet that can be strongly attached to metal surface. UC19, hidden charging interface,with a CREE XR-E Q5,it provide 240 lumens brightness and 280 meters beam distance. Domineering design of the head and a easy to grip shape won many praise by old customers. With comprehensive consideration of portability, performance, shape design and other factors. No matter it’s use in outdoor sports, like hiking, camping, night riding, exploring, or hunting, searching,on duty, UC17 is the first recommended flashlight. For the professional users and military applications , TR01 R5 is a right option. For daily lighting, choose a new flashlight TC18 which has more humanized design is right. 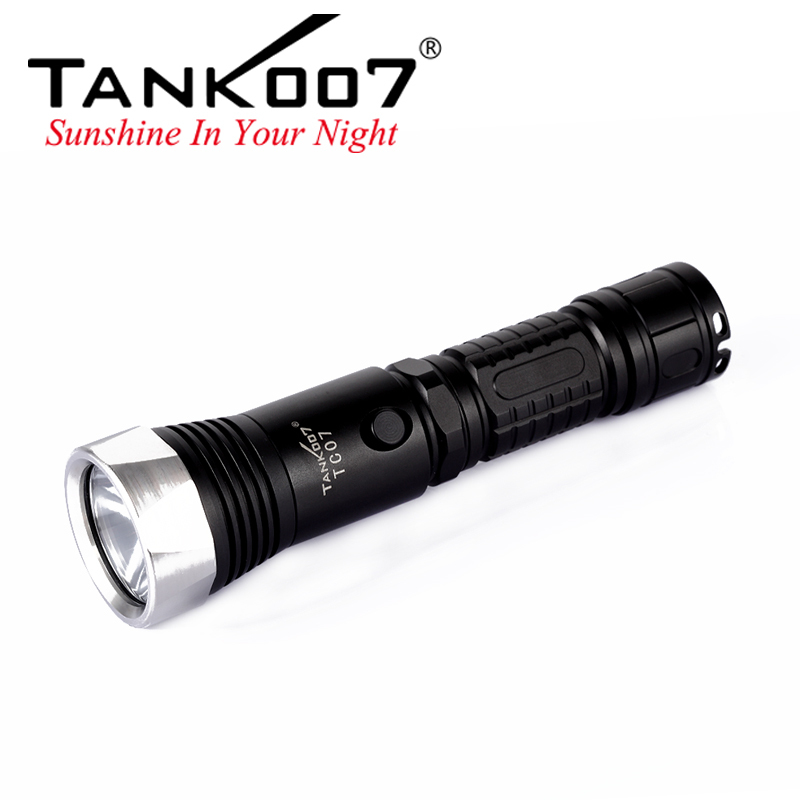 There are still several products of TANK007 rechargealbe flashlights, such as TC01, PT12,TR218,etc. They are also best flashlights, due to limited space, we will introduce next time.